Our A Coruña cruise port guide gives you information about the docking location, cruise dock, transportation options and much more! 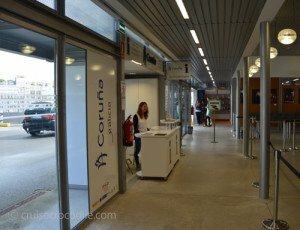 Welcome to the Cruise port guide of A Coruña. This city of about 250.000 inhabitants is the Galicia’s wealthiest city and until recently the largest city and capital of the region. A Coruna still holds a certain statues in Galicia and many would still call this the best city to visit in the area. It has a certain charm to it that in unequaled by any city. It’s promenade, lighthouse and cuisine make it something unique that hopefully every body will get to experience while here. Galicia is completely different than the rest of Spain. Galicia is located above Portugal on the Atlantic ocean and because of its geographical position you could imagine the climate is much different. Therefore Galicia is often described as green Spain. Even culturally things are different here compared to the rest of Spain. Santiago de Compostella is religious site known throughout the world for its importance as pilgrim site. Easy days in town roaming around the town, on your way to the religious sights or enjoying the beautiful landscapes, it is up to you. This will be your view from the ship. The building in the left hand lower corner is the cruise terminal. 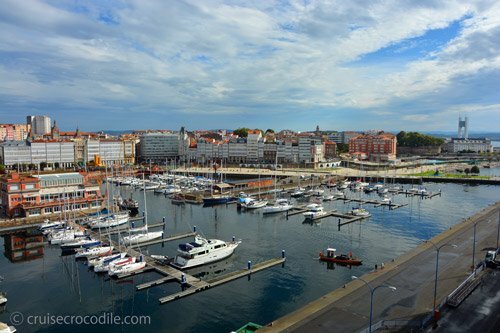 When your ship is docked you have a beautiful view over the marina and the city centre of A Coruna. Be sure to go outside and get your first impression of this mighty city this way. This is the cruise terminal of A Coruna. 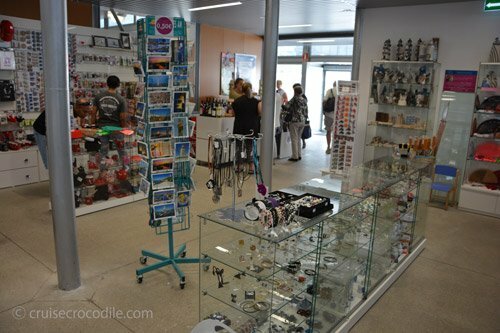 Find tourist information and souvenir shop inside. The friendly tourist information is ready inside the terminal for any questions. Cruise ships in A Coruna dock at the Muelle Trasatlanticos. 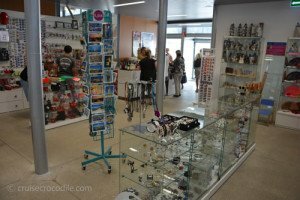 The cruise terminal at A Coruna has some facilities like tourist information and a souvenir shops. Pick up your local maps here and just venture off. From the cruise terminal you walk straight into the town. Within a few hundred meter you are already on the main shopping street. This is why the ships usually do not provide a shuttle bus service. The most interesting part of town is all situated on a peninsula (see map above). This peninsula is about 3 km across. If you would walk the boulevard around the peninsula it would be about 6 km total. This part of town is great to explore by foot. A Coruna does not have a lot of tourist facilities like hop on hop off bus or tourist train etc. but if you do not want to go around by foot public transport would be another option. Bus nr. 3 is great for sightseeing. When you walk out of the port and hit the main street the bus stop is directly to the left hand side. Pick up bus nr. 3 here. It is a great line to pick up because its route drives by the mayor sights of the town. A Coruna is the perfect spot to get on a bicycle and explore the area in an active way. There are several spots where you can rent bicycles. We have marked some spots for you in the map above as well. The shopping mall at the dock has wi-fi available for you. This is a must see in A Coruna. At about 3,5 km from the ship you will find this unusual structure. It is a 55 meter tall lighthouse with 2000 years of history. It is the only standing Roman lighthouse in the world and the oldest working lighthouse in Europe. It is without doubt the most famous site of A Coruna. Visit the surrounding parks and works of art of go inside and learn more about its origin and value. This is the main square of A Coruna. Make sure to have this on your list when you plan on walking through the city. This square has lots of bars and restaurants on it that all serve local specialties. Just a few hundred meters from the ship you will find the shopping street of A Coruna. 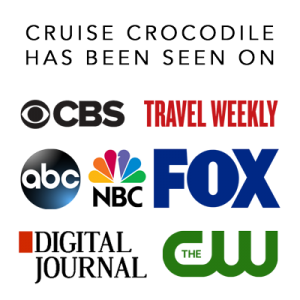 Find all kinds of boutiques and commercial shops side by side. Like many Spanish cities also A Coruna has an old town and although it is not the best you will probably come across on your itinerary it is worth a small detour. It is close to the ship and a leisurely stroll through this area of town always makes for great pictures. This is the A Coruna cruise dock. It is called the Muelle de Trasatlánticos. It located right in front of the city center of A Coruna. From here it is a short walk to the old town. 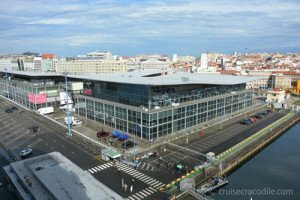 Read all about the cruise facilities in the full A Coruna cruise port guide. Paseo Maritimo is also known as Waterfront Boulevard. It skirts the entire city. It is the longest promenade in Europe. 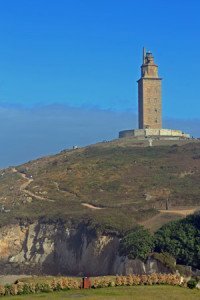 By following this promenade you will pass most of A Coruna’s important sites, such as the Castle of San Anton and the tower of Hercules. Rent a bicycle because A Coruna is perhaps best explored by bicycle. There are plenty of places where you can rent bicycles. One of these locations is Eco-logica. This is about a 10 minute walk from the ship. Typical for A Coruna’s architecture are the galerias. These are the balconies enclosed in a glass frame. It protects the houses from the Galicia cold winters and making it usable all year round. Official taxis in A Coruna are white and they have a meter. In the morning your will find a limited amount of taxis at the shopping mall in front of the cruise terminal. 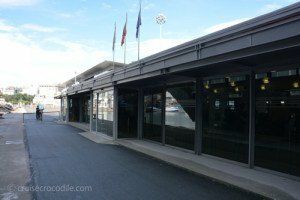 Exit the A Coruna cruise terminal and you will stand in front of this building. This indoor shopping mall offers lots of shops and free wi-fi. This city beach is about a 10 minute walk from the ship. When you are here in the winter months it is a great beach for a stroll and in the summer months it transforms into the busiest part of town. Mind you there are no facilities at this beach. This traditional Spanish Galician dish is something you have to try. This is not for everybody but for the foodies amongst us this is a must try. Boiled octopus with sweet paprika. On the main square called Maria Pita stands the statue Maria Pita. This clever and courageous lady defeated Sir Franci Drink in the 16th century. For this she is considered to be Spanish Hero and therefore here statue stands here ever so proudly in A Coruna. Sometimes the Paya del Ingles offers a free shuttle service to their shopping mall. Check if you can find a sign like this in the cruise terminal. On it you will find the schedule.